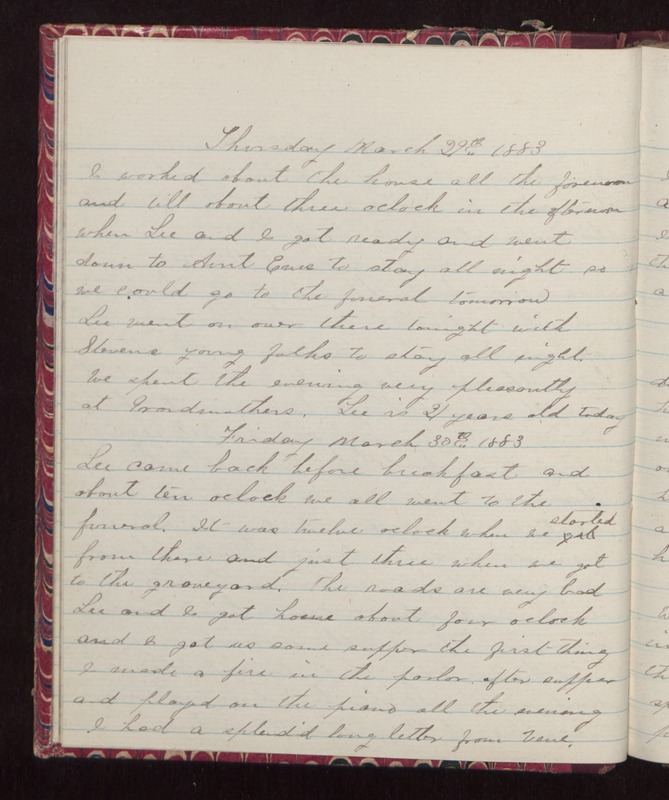 Thursday March 29th 1883 I worked about the house all the forenoon and till about three oclock in the afternoon when Lee and I got ready and went down to Aunt Ems to stay all night so we could go to the funeral tomorrow Lee went on over there tonight with Stevens young folks to stay all night. We spent the evening very pleasantly at Grandmothers. Lee is 21 years old today Friday March 30th 1883 Lee came back before breakfast and about ten oclock we all went to the funeral. It was twelve oclock when we started from there and just three when we got to the graveyard. The roads are very bad Lee and I got home about four oclock and I got us some supper the first thing I made a fire in the parlor after supper and played on the piano all the evening I had a splendid long letter from Vene.